Animal lover, philanthropist honored for work in securing a future for homeless pets - The Resident Community News Group, Inc. | The Resident Community News Group, Inc.
Board members Mike Gehlen, Kristine Cherek, Gary Meeks, Lisé Everly, Sean Lueck and Linda Berry Stein with Development Director Theresa Scordo, Chief Executive Officer Denise Deisler, Nancy Peterman, Chief Operating Officer Nikki Harris, Ann Korczyk and Chief Medical Officer Dr. Stan Hill raised a toast at a special campaign recognition ceremony to honor Linda Stein. 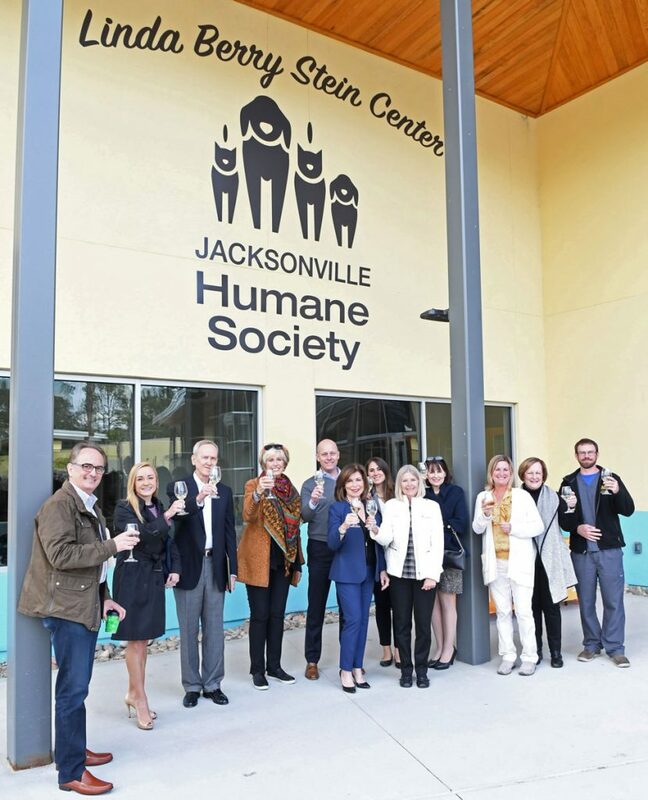 The Jacksonville Humane Society (JHS) celebrated the end of the Campaign for a Compassionate Community and honored Linda Berry Stein, campaign chair and major donor with a special ceremony Jan. 15 at the Beach Boulevard facility. The campaign raised $14.5 million to build the JHS Adoption, Education and Pet Help Center after a fire had destroyed the former center in 2007. The Campaign for a Compassionate Community began in 2013 with a goal of raising the funds needed for a new building. Construction for the new center began in 2016 and the building officially opened in November 2017. At the ceremony, JHS unveiled a prominent sign that features Linda Stein’s name in appreciation for her personal contributions and dedication to the animals in Jacksonville. 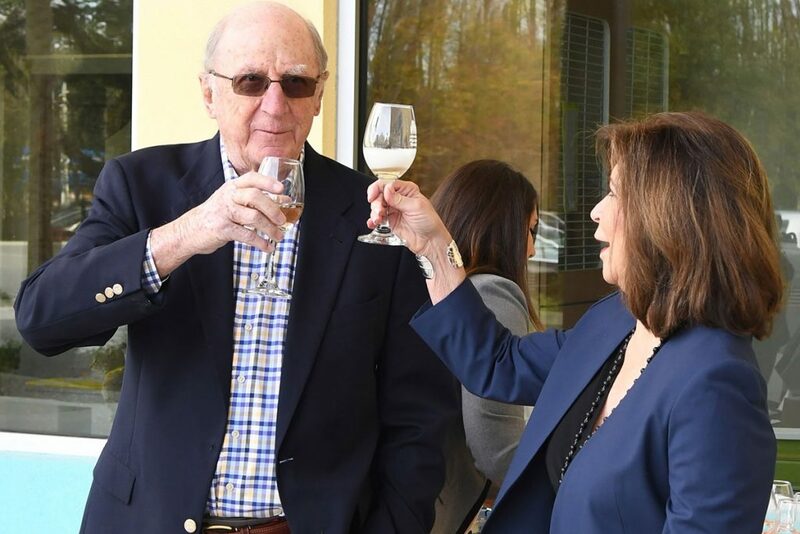 David and Linda Stein toast the completion of the Campaign for a Compassionate Community at the Jacksonville Humane Society. “We’re celebrating our campaign chair, Linda Stein, and her success. It’s a special day to honor Linda for all of her hard work leading us here, as well as take a deep breath, and say ‘Yes, this is done and so what’s next?’” said Deisler. Deisler said the JHS would be taking on a regional and state role, using their experience to share with other communities who may be endeavoring to do the same. “We’ll share with them how to do a great adoption program, a great intake program, best practices, model programs and we’re just at the beginning of sharing that. We’ll always be committed to our community and now we’re committed to sharing that and helping other communities have great moments like that, too,” she said.